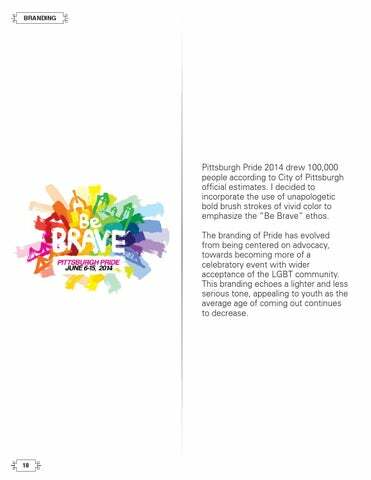 Pittsburgh Pride 2014 drew 100,000 people according to City of Pittsburgh official estimates. I decided to incorporate the use of unapologetic bold brush strokes of vivid color to emphasize the â&#x20AC;&#x153;Be Braveâ&#x20AC;? ethos. The branding of Pride has evolved from being centered on advocacy, towards becoming more of a celebratory event with wider acceptance of the LGBT community. This branding echoes a lighter and less serious tone, appealing to youth as the average age of coming out continues to decrease.